OTTAWA — U.S. President Donald Trump said Monday that the United States and Mexico have reached a bilateral trade "understanding" that could lead to an overhaul — or perhaps the termination — of the three-country North American Free Trade Agreement. According to the New York Times, under the terms the United States and Mexico agreed to, automakers would be required to manufacture at least 75 per cent of a light vehicle’s value in North America -- up from 62.5 per cent -- in order to qualify for zero tariffs. They will also be required to use more local steel, aluminum and auto parts, and have a certain proportion of the vehicle made by workers earning at least US$16 an hour, the Times reported. Trump extended an invitation to Ottawa to join what he cast as American-Mexican trade negotiations, which have stretched through the summer without Canadian officials at the table. Canadian Foreign Affairs Minister Chrystia Freeland will head to Washington on Tuesday to re-join face-to-face negotiations with the United States and Mexico on the future of the North American Free Trade Agreement. Trump also threatened Canada that if it can't reach a new trade deal, then he will slap it with devastating tariffs on automotive imports. "We'll start negotiating with Canada relatively soon, they want to negotiate very badly," Trump said in the Oval Office, with Mexican President Enrique Pena Nieto joining by speaker phone. "But one way or the other, we have a deal with Canada. It will either be a tariff on cars, or it will be a negotiated deal; and frankly a tariff on cars is a much easier way to go, but perhaps the other would be much better for Canada." Through an interpreter, Pena Nieto reminded Trump four times Monday that he hoped Canada would be part of an eventual trilateral agreement. "It is our wish, Mr. President, that now Canada will also be able to be incorporated in all this. And I assume that they are going to carry out negotiations on the sensitive bilateral issues between Canada and the United States," the Mexican president said. It's unclear when Canada will re-enter trade talks with the U.S. and Mexico. Foreign Affairs Minister Chrystia Freeland is in Europe this week on diplomatic visits to Germany, Ukraine and France. Trump suggested he would terminate the 24-year-old trilateral pact with Canada and Mexico — a deal that has been critical for the Canadian economy — and replace it. "When that happens, I can't quite tell you, it depends on what the timetable is with Congress, but I'll be terminating the existing deal and going into this deal," he said. "We're looking to help our neighbours. If we can help our neighbours, that's a good thing, not a bad thing. So, we'll start that negotiation imminently. I'll be speaking with Prime Minister (Justin) Trudeau in a little while." Trump also wants to re-baptize the trade agreement with Mexico. "I like to call this deal the United States-Mexico trade agreement," he said. "I think it's an elegant name. I think NAFTA has a lot of bad connotations for the United States because it was a rip off." Canada has been absent from the NAFTA bargaining table since trilateral talks paused last spring. Observers have raised concerns that Canada's absence from the talks could put Ottawa in a position where it might be pressured into accepting a less-appetizing deal reached between the U.S. and Mexico. Trudeau has insisted his government will only sign a deal that's good for Canada. Following Trump's announcement, Trudeau's office issued a statement saying the prime minister spoke with Pena Nieto on Sunday about NAFTA's renegotiation and "shared their commitment to reaching a successful conclusion to this agreement for all three parties." Trump also called on Canada to negotiate fairly, especially when it comes to dairy products. 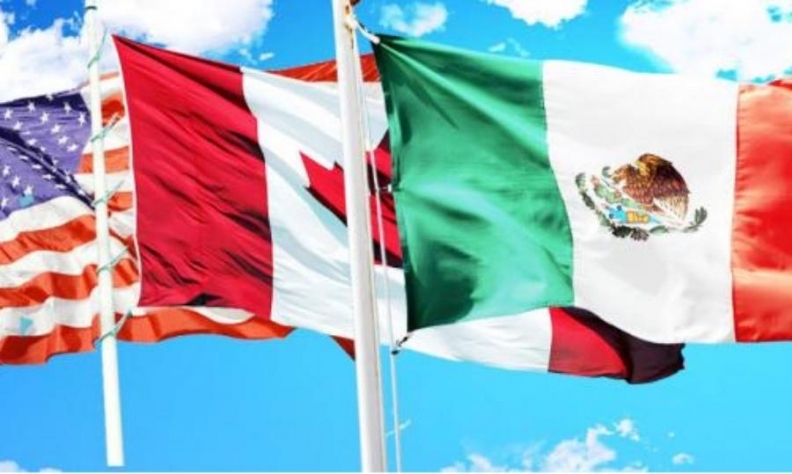 A spokesman for Freeland said Monday that "Canada is encouraged by the continued optimism shown by our negotiating partners" and that "progress between Mexico and the United States is a necessary requirement for any renewed NAFTA agreement." Adam Austen also wrote in an email that Canada would continue to work toward a modernized NAFTA.